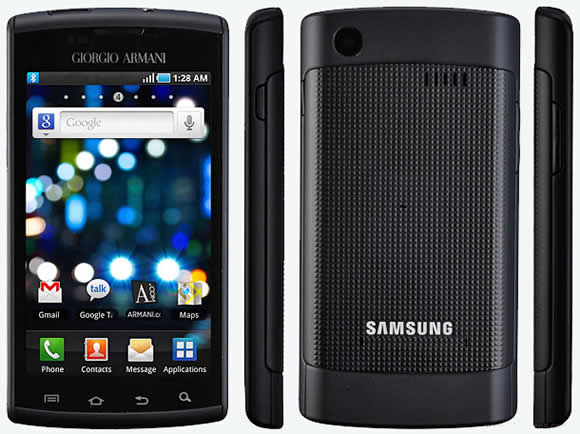 Samsung I9010 Galaxy S Giorgio Armani has 4-inches Super AMOLED capacitive touch screen with Gorilla Glass display and has 5-megapixels and HD video recorder. The super AMOLED display is brighter, clearer, less reflecting, accurate and best ever viewing quality in mobile phone. Samsung I9010 Galaxy S Giorgio Armani contains nearly all features like Android v2.2 (Froyo), High speed ARM Cortex A8 1GHz processor, HD video recording with continuous autofocus , Bluetooth v3.0 upto 24Mbps, Swype text input method. The Samsung S7230E Wave 723 is a mid ranger with aspirations of excellent built quality and runs in Bada OS. The S7230E Wave 723 has a neat hardware features like GPS,Wi-Fi,3G,new Bluetooth v3.0 upto 24Mbps etc,. But disappointing screen resolution, no front camera for video calling. 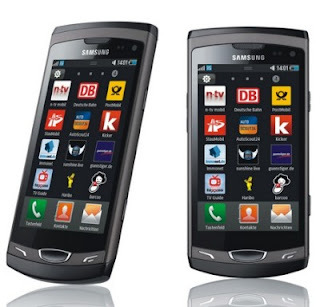 Samsung wave II has 3.7-inches Super clear LCD capacitive touch screen with 5-megapixels and HD video recorder. Wave II is same as that of its original Samsung wave but wave II has big screen, . High speed 1GHz processor, HD video recording, Bluetooth v3.0, 2 GB internal memory.